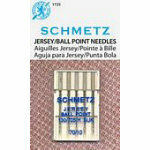 Also called Jersey Needles the medium ball point makes them perfect for knit fabrics. System: 130705 H SUK. Size 1070. 5 needles per pack. 10 cards per box.